Helmets are one of the most important pieces of cycling safety gear that you can buy. Head injuries are one of the most common ways for cyclists to suffer serious injuries on the road, but wearing a helmet will certainly protect your head in many types of collisions. 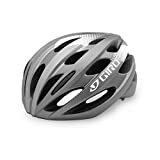 In fact, the safety advantages of wearing a helmet are so great that in many countries it is now been made a legal requirement to wear one when cycling. Regardless of any legal requirements, one thing that is for sure is that children should always wear a helmet when cycling. This is because they are more prone to more inexperienced decisions (and hence more likely to have an accident), and have softer skulls (and hence need head protection more). In the past, many people didn't wear helmets because they felt they were heavy, sweaty and uncomfortable. However, with modern helmets these should no longer be issues. 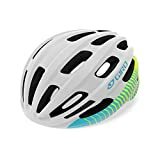 Modern helmets are ergonomicaly designed and so light that you will be hardly aware that you are wearing one, and they also have many large vents to let plenty of air in. One other thing to be aware of is that it is important that you get a correctly fitting helmet and that you position it properly on your head. For example, a common mistake is to position the helmet too far back on the rider's head - and if you do this and get into a collision, the helmet will simply get pushed off the back of your head without actually protecting you. You should also make sure that the straps are securely fastened with equal tension in each of the straps - sufficient tension that if you open your mouth you should be able to feel the helmet pressing down on to the top of your head. Once you've had your helmet for a while, it may start to get a little smelly. That's not a problem however as the pads inside the helmet are generally secured by velcro, so can be detached, and either put in the washing machine or replaced with new pads. MIPS equipped - The MIPS Multi-Directional Impact Protection System consists of three main components: the EPS liner, the Low Friction Liner and an elastomeric attachment system between them. In an angled impact, the elastomeric attachment system stretches to allow the EPS liner to rotate independently around your head. Universal Adult Sizing: 21.25" - 24"
Sometimes the simplest designs are also the smartest. The Trinity is an easy ft for riders who want a classic cycling helmet that doesn't compromise comfort or performance. It includes key features like In-Mold construction to keep the weight low, and the easy one-handed adjustments of our acclaimed new Roc Loc Sport system for a quick, sure ft no matter where or how far you ride. The Savant is an amazing fit for riders who enjoy great routes as much as a swift pace. The slim shape combines impressive ventilation thanks to 25 wind tunnel vents and the comfortable convenience of the adjustable Roc Loc 5 fit and stability system. And with the lightweight and durability of in-mold construction, it won't weigh you down. SUPERIOR TECHNIQUE FOR YOUR SAFETY. We follow 3 crucial steps to achieve a solid constructed bicycle helmet by first placing the exterior shell in the mould, then reinforcing it with a skeleton and finally adding the foam that will hold all the parts firmly connected, thus making sure you are safe in a case of an accident. ALL ACCESSORIES INCLUDED. 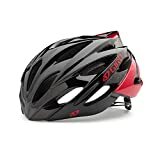 This specialized bike helmet for adults and teens has all the added features you need: sleek matte design for a classy look, detachable visor that offers constant protection from the elements, washable pads and a cushioned chin strap for increased comfort! Cycling has just become safer, more comfortable & more fun! 2-YEAR MANUFACTURER WARRANTY to make this the perfect companion for mtb racing, commutes to work or pleasure rides. Take advantage of this risk-free purchase and invest in your safety...and your looks. Make no compromise on SAFETY or LOOKS with the state-of-the-art unisex AirFlow Bike Helmet from Team Obsidian! Lightweight, but very durable and resistant to shocks, this is a high-performance helmet made with an incredible attention to details and the finest materials available. Why choose it? REAL SAFETY! Cheap plastic helmets do little to protect you in case of a fall. High quality helmets like the Team Obsidian Airflow Bike Helmet are made through the in-mould advanced technology. The American Made EPS is molded under pressure to create a thick EPS (expanded polystyrene shell) protective layer melted together with the super-strong, thick outer plastic layer in order to uniformly absorb the shock of an impact. Perfect fit or your money back! How many times did you buy an allegedly "one size fits all" product just to see it does not fit? To avoid that we designed two different sizes S and M/L (we don't have XL) and a special interior shape that fits the human head better. You get an incredible deal! Why? Headsets of similar quality, design and material sell between $120 and $250. Due to special deals with our suppliers and our low marketing budget we dropped the price so anyone can enjoy top-notch quality and increased safety. Customers say our helmet is better than the popular brands. We believe so too and we offer you the chance of a RISK-FREE purchase due to our iron-clad guarantees and LIFETIME MANUFACTURER WARRANTY. Click the "Buy Now" button and invest in your safety and performance today! Integrated MIPS Technology - The MIPS Multi-Directional Impact Protection System consists of three main components: the EPS liner, the Low Friction Liner and an elastomeric attachment system between them. In an angled impact, the elastomeric attachment system stretches to allow the EPS liner to rotate independently around your head. UNIVERSAL FIT SIZING: 21.25" - 24"
The Fixture MIPS brings confident, mountain bike style and breezy ventilation together in a compact design that complements nearly any rideespecially when theres dirt under tread. Some of our best features, like In-Mold construction coupled with the ease and comfort of our acclaimed Roc Loc Sport fit system, offer the versatility you need to ride everything from fire-road adventures to swooping singletrack trails. The Roc Loc is also seamlessly integrated with the Multi-Directional Impact Protection System (MIPS), which can redirect energy and provide more protection in certain impacts. 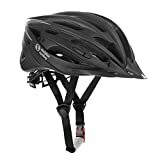 【ADJUSTABLE SIZE FUNCTION】 Adult bike helmet with Dual Fit adjustable design, There is a adjusting knob at the back of the bike helmet, helping to adjust the head circumference. Adjustable Size: 22-24 inch (57- 61 cm). 【SAFETY PROTECTION】 High-density imported PC case with superior technology will surely improve safe performance. 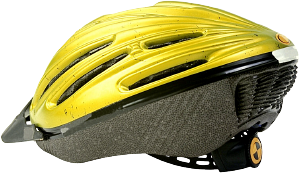 Bicycle helmet with durable hard shell, soft pad can absorb the pressure caused by external impact. Adult wear Bike Helmet will feel Safer and more comfortable, it will protect your head in all directions. 【30 DAY MONEY BACK GUARANTEE】 All of our customers can return and get refunded in case the purchasing is not satisfied for any reason. You have no risk to try. There is a adjusting knob at the back of the bike helmet, helping to adjust the head circumference. The inner sponge lining can unpick to wash and it is comfortable and breathable. 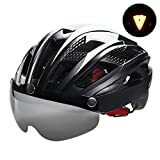 This Bike helmet can used perfectly another two type of bike helmet goggles, Yellow Goggles lens and Colorful Goggles lens, this two lens selling separately. Ride confidently and safely with the Schwinn Thrasher Microshell Bicycle Helmet. The dual-fit, 360-degree adjustable system allows for on-the-fly adjustments. Tapeless technology increases durability and adds unique styling. This helmet offers full-shell coverage for ultimate protection. Founded in 1895, Schwinn is an American icon, building some of the best-known and best-loved bicycles of all time. From its very beginning in Chicago, Illinois, the Schwinn mission has been to develop bicycles that allow people to experience the confidence and freedom that comes from riding a bike. Ride confidently and safely with the Schwinn Thrasher Microshell Bicycle Helmet. The dual-fit, 360-degree adjustable system allows for on-the-fly adjustments. Twenty-one flow vents help you keep cool, while a snap-on visor offers protection from the elements. Tapeless technology increases durability and adds unique styling. Heat-sealed pads are integrated for comfort and durability, with side strap-adjusters to assist with a proper fit. This helmet offers full-shell coverage for ultimate protection. Zacro lightweight bicycle helmet can give you a enjoyable and safe journey during riding. The tough and durable PVC & PC, EPS foam material that decreases the impact forces of the collision would stop worrying about the hurt. Riding with Zacro bicycle helmet can meet your satisfaction and have a wonderful time.